Yesterday, the Rhinos announced that team captain and 2006 team MVP goalkeeper Scott Vallow has agreed to a two year contract extension that will keep him in Rochester through the end of the 2009 USL 1st Division season. 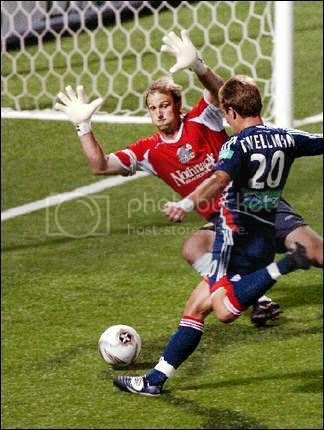 2007 will mark Vallow's seventh season in Rochester and he is coming off a stellar 2006 season where he led the USL 1st Division in wins, shutouts, and saves and was a 2nd Team All-League selection. Thankfully, neither Scott nor the team has to worry about what might happen should the season end and Vallow become a free agent. It will be interesting to see if the Rhinos now try and extend the contracts of other free agents-to-be starting with defender Kenney Bertz. The Rhinos also announced the signing of four other players yesterday. Defender Chris Aloisi, midfielder Stephen Shirley-Black, and the Rhinos two 2007 draftees Ryan Wileman and PJ Scheufele were on hand as the club announced that they had also agreed to terms with the club. Aloisi joins the Rhinos after stints with the LA Galaxy, SJ Earthquakes, and 2006 MLS Cup Champs Houston Dynamo. The Syracuse University product is expected to battle for the starting job at right back that has opened up with Frankie SanFilippo's move to the Carolina RailHawks. Shirley-Black is a left footed midfielder that Rhinos head coach Laurie Calloway mentioned will be in the mix to replace Greg Howes at the defensive midfield spot. Shirley-Black played college soccer at VCU with Rhinos forward Matthew Delicate, was recruited to play for the Des Moines Menace of the PDL while Laurie Calloway was there, although he didn't play for the Menace until Calloway's first season in Syracuse, and he spent last season with the KC Wizards reserve team. The Rhinos released a list of 50 players that will be headed to Florida to take part in the 2007 Rhinos combine starting on Saturday. Chase Harrison - Was a developmental player for Real Salt Lake in 2006 and was with Virginia Beach on loan for part of the season. Nikolai Myhre - 20 yo who's last club is in Norway's 3rd division. Hassen Maamar - 23 yo from Tunisia who holds a green card and has played in the 1st and 2nd division in his home country with Jendouba Sport 1922.